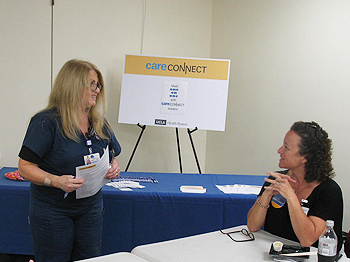 Future users of CareConnect had an opportunity to learn more about UCLA’s electronic health record program at two informal drop-in events held in Westwood and Santa Monica this month. Events were hosted at Ronald Reagan UCLA Medical Center on Aug. 22, and Santa Monica UCLA Medical Center and Orthopaedic Hospital on Aug. 30, as part of a series called “An Opportunity to Meet One-on-One with CareConnect Leaders.” The drop-in events were designed to give some of the approximately 15,000 future users an opportunity to meet the members of the CareConnect leadership team, learn about CareConnect, ask any questions they may have about how the system will affect them, and give us their feedback. 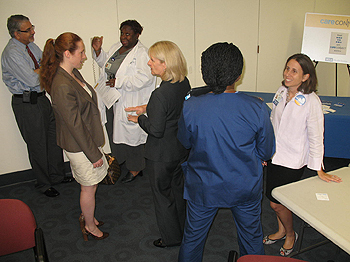 Faculty and staff members from throughout UCLA Health System and David Geffen School of Medicine attended the events, including physicians, nurses, and scheduling staff –- from departments ranging from respiratory therapy to intensive care. CareConnect will first go-live in July 2012 with the scheduling, registration, billing, and admission, discharge, and transfer functions throughout the health system; and clinical documentation and order entry at a group of ambulatory clinics. Rollouts continue throughout the next year, with go-lives at the Westwood hospitals in October 2012, and the Santa Monica hospital approximately six months later. View the timeline. 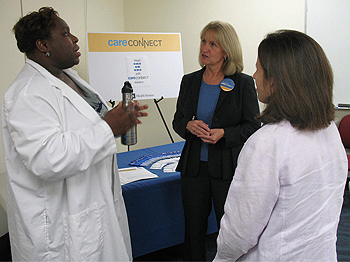 CareConnect is planning additional drop-in events as we get closer to go-live dates. 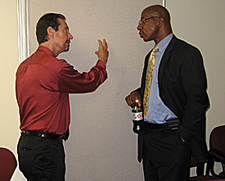 Continue to visit our website for the latest information about CareConnect and future events. If you have questions or comments about CareConnect, drop us a line on our Contact Us page. Or take a look at our recently updated FAQs page for the most commonly asked questions about CareConnect. 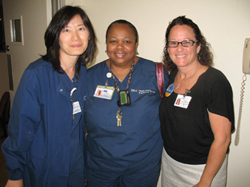 UCLA Medical Center and Orthopaedic Hospital Aug. 30.